The oldest existing forensic science text is The Washing Away of Wrongs (also known as the Collected Cases of Injustice Rectified, or Hsi yuan chi lu), written around 1247 CE. Sung Tz’u (or Song Ci), who is considered to be the “Founding Father of Forensic Science in China,” wrote this text to help bureaucrats of the Southern Sung Dynasty navigate the complex inquest process, provide instructions on how examine a corpse, and determine cause of death. This forensic manual predates the earliest European texts on the subject by hundreds of years. By the time The Washing Away of Wrongs was written in the mid-thirteenth century China had already been conducting forensic assessments for violent or suspicious deaths for centuries. Going as far back to at least the Ch’in Dynasty (221-207 BCE), the Chinese government ordered forensic investigations in hanging deaths (Sung 1247/1981, p. 4). Then in 995 CE, a decree was issued establishing an inquest system for homicides, unusual deaths, and serious injuries. Bureaucrats, not full-time detectives or forensic scientists, were responsible for leading inquests as a small part of their duties (Sung 1247/1981, p. 5). Professionals, who were the equivalent of coroners or midwives, were asked to examine a corpse during an inquest (Sung 1247/1981, p. 11). According to McKnight’s translation (1981), there was an institutional distrust of coroners and midwives because they were not government officials (Sung 1247/1981, p. 18). So bureaucrats were tasked with confirming the findings of a coroner during an autopsy (Sung 1247/1981, p. 21). To do this, they had to be able to indicate the specific wound responsible for death, differentiate between accidental and deliberate deaths, and distinguish between peri-mortem and post-mortem wounds (Sung 1247/1981, p. 21). The Washing Away of Wrongs was written as step-by-step guide to avoid errors during this process because Sung Tz’u believed it was important to prevent the miscarriage of justice (Sung 1247/1981, p. 38). He compiled “materials from various authors, corrected them, and added his own observations (Sung 1247/1981, p. 39). The parts of this text where Sung Tz’u discusses proper inquest procedure and documentation are pretty boring. But the sections about the human skeleton, decomposition, and case studies are really interesting because they illustrate the use of forensic anthropology in a medieval context. In the below excerpts from Brian McKnight’s 1981 translation of The Washing Away of Wrongs, Sung Tz’u describes how medieval investigators tried to use forensic anthropological techniques to differentiate between male and female bodies, time since death, and cause of death. Although there are many inaccuracies, it’s fascinating to read how these methods were starting to be developed and applied in different cases. Man has three hundred sixty-five bones, corresponding to the three hundred sixty-five days in a year. Skulls: in a male, there are a total of eight plates, counting from the nape of the neck to the ears, together with the plates of the back of the skull. There is a horizontal suture across the back of the skull and a vertical one running down to the hairline in the back. In women, there are only six plates. There are only six plates. There is a horizontal suture across the back of the skull, but no vertical suture. During the three months of autumn, after two or three days have passed, a body will be first as described above for the spring, with the flesh of the face, belly, ribs, and chest changed in color. After four or five days, a foul liquid will issue from the mouth and nose, the whole body will swell, the lips will curl back, and blisters will appear. After six or seven days, the hair will out. During the three winter months, when four or five days have passed, the flesh of the corpse will turn yellowish purple. After half a month, the symptoms described above will appear first, with the face, mouth, nose, sides, and chest all changing color. Sometimes, if the place is damp, and the corpse is wrapped in mats and buried, this will slow the process of decay. Again, consider carefully whether it is the beginning or end of the month, and determine your actions according to the seasons of spring or autumn. When it is extremely hot, decomposition of the corpse begins even after a single day. It becomes livid or blackish and begins to smell. After three or four days the skin and flesh become rotten, the corpse swells, maggots appear, there is a discharge from the mouth and nose, and the hair falls out. Formerly, a man was found drowned in a deep pool. He had been there a long time. The affair was made known because of spite. The investigating official saw that the corpse had no skin or flesh left on it. Only the skull and bones remained. A succession of dispatched officials were not willing to hold an inquest. The superior office assigned the responsibility to several men. Only one official was willing to accept it. He then went to the place to examine the bones. First, he very carefully examined what could be seen. There were no other pieces of evidence. He then took the skull and washed it. He took a hot water jug and carefully poured clean hot water into the skull through the fontanel, examining the water to see if any sand or mud came through the nose. He used this to determine whether or not the victim had been alive when he entered the water so had drowned. Generally, when living people fall into the water, sand or dirt will be aspirated into the nose. If the body was put into the water after death, then there will be no sand or mud. Sung, T. (1247). 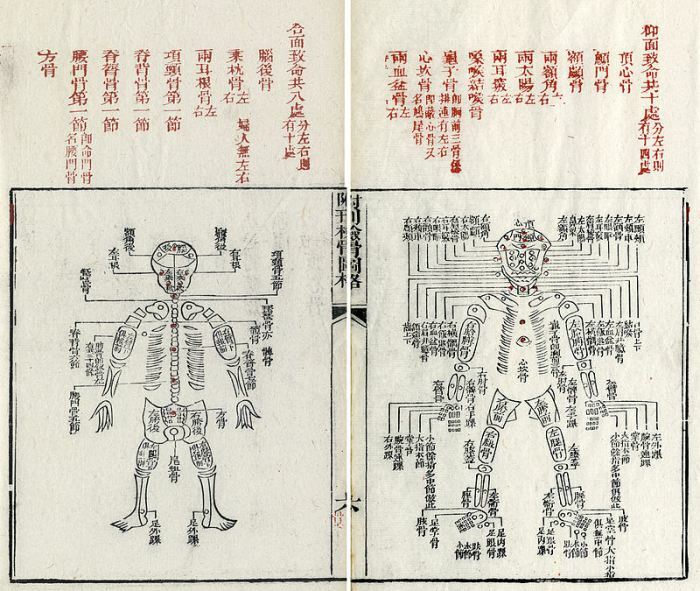 The Washing Away of Wrongs: Forensic Medicine in Thirteenth-Century China (Science, Medicine, and Technology in East Asia). (Brian E. McKnight, Trans.). Ann Arbor, MI: Center for Chinese Studies, The University of Michigan. (Original work published in 1247).